Once again, Stella was a rock star for her rehab process after the injection of her sacroiliac joint. Once we were able to ride her again she was looking a feeling great. We started to add canter work and for a few weeks it was looking better than before. 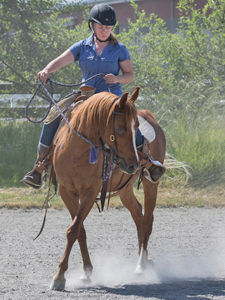 But after some time, she began again to feel unbalanced to the right and swapping the canter lead in the hind. Overall this procedure sadly did not solve her problem. Dr. Fleck said that without a bone scan and the unknown, there is not much we can do to fix the canter. 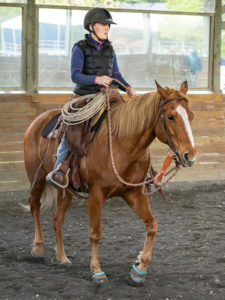 Now she is comfortable to remain a walk/trot horse, so that is the direction we are taking her in. 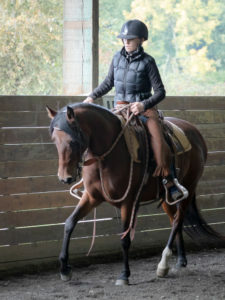 We are working on strengthening her with trot work and exercises over poles.